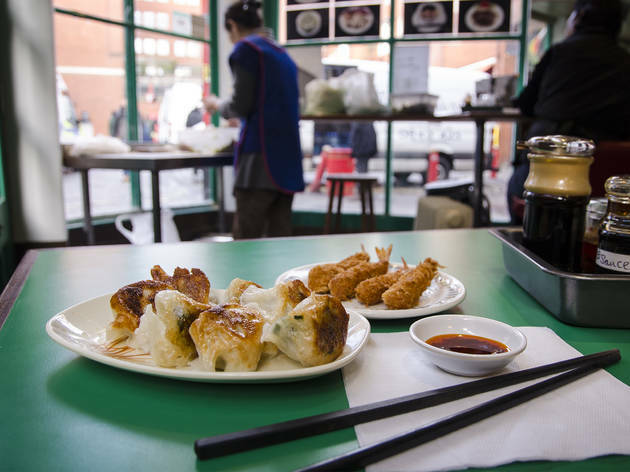 If dumplings drive you to deliriums of delight, make friends with Jen – a Chinatown café where the pillowy parcels reign supreme. This green-painted café occupies a prominent Chinatown corner site where you can often watch the cooks sitting in front of the windows wrapping the hand-made dumplings. The cheapest dish is the northern Chinese snack of jiao zi, on this menu called ‘Beijing dumplings’, costing a mere fiver: eight white sachets like overfilled ravioli, in either a pork or vegetarian version. The same dumplings fried are guo tie, ‘fried dumplings’, at £6; also called ‘pot stickers’ in American English, these are closely related to Japanese gyoza. The wonton soup is yet another variation on this, and is worth the £6 for the intensely savoury stock. There are plenty of other dishes served at this simple, no-frills café, from buttered toast through barbecued pork to Hong Kong-style tea and Taiwanese-style bubble teas, but it’s the freshly-made dumplings that keep us coming back. Main courses £5-£16. Meal for two with soft drinks and service: around £25. Disappointing! It is probably ok if you only have the dumplings.. What can I say, as a tastemaker, I seriously question why I stopped by in the first place, I really should have known! We did enjoy the dumplings but everything else was awful, the service, the level of cleanliness and finally ...the main dishes...We had 'duck noodles' - I say 'duck noodles' because the 'duck' was mostly pieces of duck skin and bones, the 'noodles' looked like super noodles, and it was dumped into a broth which tasted like salt+water and nothing more. Please don't visit unless you like being disappointed. Fancy no fuss but yummy dumplings? You found the ideal place! I've eaten their freshly made dumplings as well as roast duck rice noodle soup. I think dumplings were better than the roast duck but duh you don't come here for roast ducks! That was a silly choice on my behalf. Def try their handmade dumplings. After seeing one too many tantalizing pics on Instagram I decided to finally try out these legendary dumplings! They are fresh that's for sure! I ordered the veggie fried dumplings and they were perfectly cooked!! Piping hot,crispy on the outside and full of glass noodles,mushrooms and secret recipes I presume on the inside! My only complaint would be that the dumplings needed more salt in order to bring out the flavor of the filling. Apart from that I'd say it was well worth it. Its not a full on restaurant but if you're in the mood for some dumplings which won't cost you more than £6 for 7 than this is the place! Did I also mention that its incredibly filling! Yup I'll be back! Cheap and cheerful. Not a place to linger or have a proper meal. 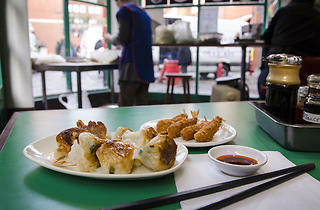 Pop in, grab a few dumplings and get on your way. Best place to go to if you're looking for a cheap and fast place. The friend dumplings are to die for and definitely worth the price. 100% happy with my choice and will go again. Even with months of experience in China, the dumplings made in Jen Cafe were without a doubt the best we ever had. Simple - no fuss, small plastic chairs, just sit, eat and enjoy! My friend and I went to Jen Cafe because we knew it would be quick service and one of the cheaper places in Chinatown. I chose choy sum and pork dumplings, both of which were piping hot and wholesome. My friend had noodles in a savory clear stock with crispy pork which he also thought was tasty and authentic. The only let down was the hot soya milk we ordered, mine was tepid, which is crazy as surely it's a matter of leaving it in the microwave a bit longer. We will however continue to go.